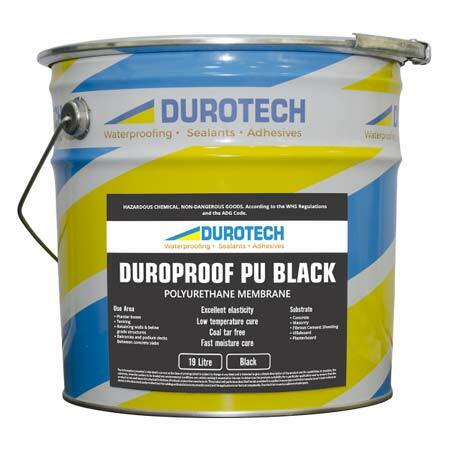 DUROPROOF PU BLACK ECO is a high quality, superior performance single component liquid that cures to rapidly to form a polyurethane membrane that is tack-free, high modulus, tough, and flexible. For non exposed use only. Planter box internals and retaining walls. Roof and Deck areas that are to be paved over with a sand bed, ballasted or otherwise covered without bonding. Reinforced concrete and fibrous cement sheeting floors in bathrooms and laundries. Waterproofing beneath screeds on decks, balconies, and podium levels prior to the application of a variety of surface finishes, such as tiles. Good adhesion to a wide range of substrate. Decrease in construction cost and time. Can be applied as a single constant finish at 1mm thickness. Tack-free cure & walkable overnight. Complies with Green Star requirements. Good abrasion and tear resistance. Class III – elongation as per AS/NZ 4858 High build application is possible.